It created a brouhaha in the Buffy/Firefly universe when writer/director/producer Joss Whedon announced last year that he had wrapped on a mysterious film project starring several favorites -- including Amy Acker, Alexis Denisof and Nathan Fillion -- who had appeared frequently in Whedon's earlier work. This time, Whedon was talking an updated, black-and-white version of Shakespeare's Much Ado About Nothing, the one with witty lovers Beatrice and Benedick sparring over who might be in love with whom. Or not in love. Decidedly not. Except sort of. Acker and Denisof are the lovers engaging in Shakespeare's most "merry war," with Fillion as the comic relief, a verbally impaired constable named Dogberry; Fran Kranz and Jillian Morgese as Claudio and Hero, the other pair of lovers; Clark Gregg as Leonato, Hero's dad; Reed Diamond as princely Don Pedro; and Sean Maher as bad boy Don John, the one plotting behind the scenes to screw up Claudio and Hero's love affair. According to the LA Times, Whedon and his wife, Kai Cole, had hosted readings of Shakespeare plays at their Santa Monica home for some time, but for Much Ado, they went beyond just a reading, staging and filming Much Ado right inside the house. Filming in the Whedon/Cole kitchen and bedrooms was complete in a total of twelve days, accomplished while Whedon was on a break from the Avengers movie he directed. 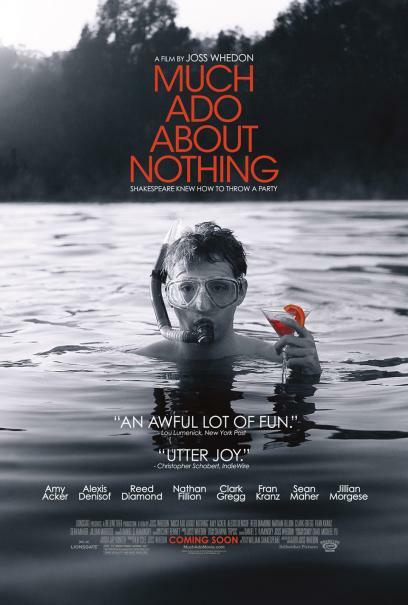 Much Ado About Nothing by Whedon and friends premiered at the Toronto Film Festival last September to mostly good reviews, and it also acquired a distributor. Which meant everyone who was eager to see this most independent of independent features was champing at the bit to get a release date. A TV spot showing off what it will look like was unveiled in May, with a June 7 date now announced for the film's initial, very limited release, which apparently means New York, Los Angeles and San Francisco. When will anybody (or everybody) else get to see Joss Whedon's Much Ado About Nothing? June 21 is the date it's supposed to go wide, but no one is sure yet how wide that will be or how many theaters it will be released to. I'm not banking on Bloomington-Normal, to be perfectly honest, but I'm going to guess there will be a Chicago venue, and maybe even Champaign-Urbana, if we're lucky. On a personal note, I definitely hope to see it by my birthday in August, because Beatrice's line from the play -- There was a star danced, and under that was I born -- suits my Perseid meteor shower birthdate. In the meantime, a trailer has been released and you can see it at the movie's official site. It definitely looks intriguing. I'm a little worried about the language, which doesn't seem to come trippingly off those tongues, but advance word has been so good... Fingers crossed! Happy Birthday YOUNG AT HEARTLAND!